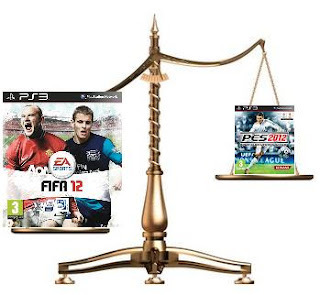 EA has claimed today that so far FIFA 12 has outsold PES 2012 by ratio 25 to 1. This is a very strong statement, and no official statistics is available yet to verify this, though one thing is clear that FIFA is well ahead indeed. Though PES 2012 has released a week later than FIFA, there is little hope that PES will manage to reduce the gap. Right from the first release of Pro Evolution Soccer series in 2001, there was a fierce competition between EA and Konami for creating the ultimate football game. EA started FIFA series earlier, back in 1993, and both publishers have been spending huge efforts for gaining the leadership. This year EA seems to show a smashing victory, and holding the record for the "fastest selling sports game ever" by selling over 3.2 million games and generating $186 million revenue in its first week of release only. PES is way behind, and FIFA seems has already collected the lion share of all the money generating potential that gamers will spend for a football game this season. Pro Evolution Soccer has only released X360 and PS3 platforms and traditionally releases the other platforms such as Wii, PS2, and PSP later, but these do not account for much volumes, and it is unlikely that their release will somehow improve the picture for PES. FIFA 12 has been holding Number 1 in charts for 3 weeks whereas PES 2012 only managed to gain 5th position in the charts this year so far.